Avery Smith is a second-year undergraduate student at Trinity College of Dublin, Ireland, studying ancient history, archaeology and the history of art and architecture. This past summer, she interned at The Equiery, at the Walters Art Museum in Baltimore and for the Maryland Steeplechase Association. She has been an active rider for over ten years, participating primarily in fox chasing. This summer, The Equiery staff took a field trip to experience Maryland’s only professional equi-tainment dinner theater, the Medieval Times at Arundel Mills Mall. The theater itself is known in official Medieval Times company lingo as the “castle.” After the show, the Equiery staff was treated to an exclusive backstage tour of the castle stables and interview with the head trainer Georgiy Gibizov. Founded in Spain in the 1970s, Jose Montener brought his medieval re-enactment dinner theater to the United States in 1983. The company now has nine locations, or “castles” throughout the United States. The Maryland castle opened in 2003. 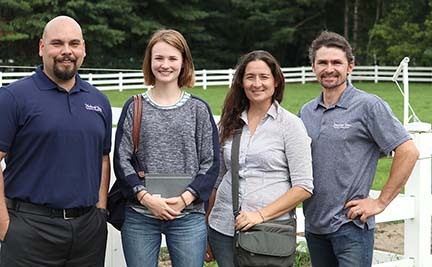 Later this summer, several Equiery staffers and summer intern Avery Smith visited the corporation’s Maryland “ranch” to speak with Georgiy Gibizov and the show’s general manager Nate Thompson. Below, Avery shares with our readers what we learned this summer. Medieval Times executes the exact same show and script every performance in every location across the country. The riders (a.k.a knights), however, get to swap out who gets to play the “champion” from show to show. The script and choreography are changed every six to seven years, and the Maryland knights are expecting to receive a new script soon, with training videos and music. Training and dress rehearsals for a new show takes around one week, and during that week, knights practice the new show in the mornings and perform the old show in the afternoon and evenings. Each show location has a “head knight,” who oversees the care of the horses. A corporate head knight visits each castle and ranch every six months. The Maryland Castle performs over 400 shows per year, and employs a total of 180 people, including cast members, riders, production people, marketing, hospitality, maintenance and management. Most of the Medieval Times knights begin with little to no horse experience, but become skilled horsemen over time. Nate Thompson, general manager of the Maryland show and a former knight, remarked that the show prefers to create their own riders, as the show needs very specific types of equestrian skills that do not always translate easily from other horse sports. Creating and training more riders (“knights”) is a constant and ongoing process within the Medieval Times organization. The jobs of the head knight and horse trainer are challenging, as it involves teaching many different horses, people, riding styles, and levels of knowledge along with maintaining all of the horses in their best condition—something as small as one heavy set of hands could send a horse askew for a while. And yes, in the world of Medieval Times, only men can become knights. The Maryland Castle has 13 knights (riders) of varying ages and skill levels. 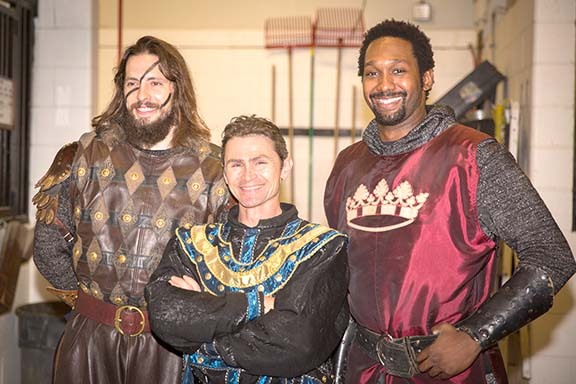 Pictured right is Maryland’s Head Knight Josh Brown, Horse Trainer Georgiy Gibizov and Captain of the Guard/Assistant Head Knight Demetrick Smith. The Medieval Times Maryland ranch is, surprisingly, a small nondescript 14 acre property with a low-key family farm feel, located an easy 20-minute drive to the castle at Arundel Mills Mall. 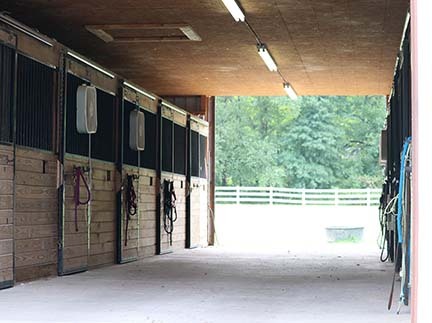 There is a simple, workmanlike center-aisle barn with 10 stalls and the usual tack room and wash stall. There are three turnout fields, a stonedust ring, and a rambler-style house for the head trainer and his wife. For the 20 minute trip to the castle at Arundel Mills, Georgiy Gibizov loads the horses into a six horse slant-load gooseneck trailer, and rumbles up the road in a plain pick-up truck – no lettering or logos on either the truck or the trailer. The head horse trainer for each “castle ranch” establishes his own relationships with local suppliers, including (but not limited to) vet, farrier, feed company and hay supplier. 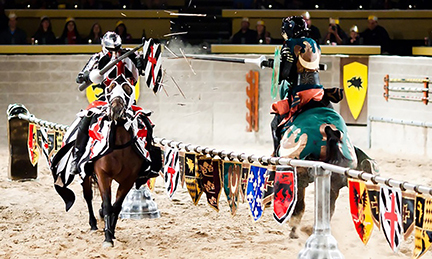 The show features jousting, gymkhana-esque games, sword fights, and even falconry – but the horses are the main attraction. Quarter Horses, Andalusians and occasionally other breeds are used, but the Andalusians are the stars, and Medieval Times is the largest breeder of Andalusians in the country. The Maryland show currently has 20 horses, using usually 17 per performance. Each Medieval Times employee seems to agree that the organization takes on a “zen” style of horse management. There are minimal problems and accidents because the trainer and knights take their time getting to know each horse, and figuring out the best method for training for that specific horse. With each horse, “you learn something new,” according to Maryland head trainer Georgiy Gibizov. Georgiy creates a specific schedule for each horse, balancing that horse’s individual needs for rest at the ranch, schooling and performance. For example, some of the horses have a harder time when Maryland’s heat and humidity climb, so those horses usually get to stay in the stalls in the castle, whose thick concrete walls and air handling system keep heat and humidity at bay. Other horses may need more trips back to the ranch for R&R. Most of the horses undergo training in the Castle’s arena, however the younger horses begin learning at the ranch. 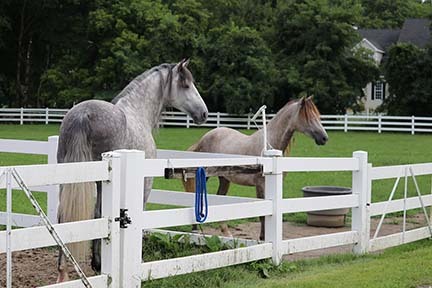 These horses are started around age two with lunging in the paddock ring, and trailer loading practice. The head trainer even watches them as they play in order to view their unique movements and make preliminary judgments about where they would fit best into the show. The Medieval Times community insists that “these horses are part of the family,” and, as The Equiery saw, they are treated as such. Once the lights have gone down and the audience has left, Medieval Times is a horse business, just like any other Maryland 20-horse operation. The horses have to be fed, hayed and watered; the stalls have to be done; vets and farriers scheduled; bedding and supplies ordered. 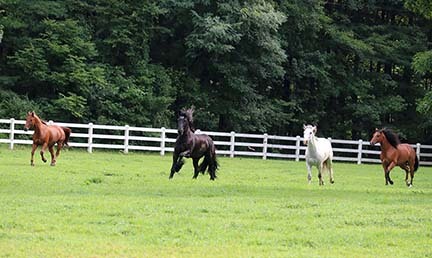 Here are a few of the equine stars of Medieval Times Maryland that we met at the Ranch!